At RockstarPrint we can design and produce whatever you can imagine for your custom arcade cabinet, we will work directly with you regarding your custom graphics. We have built up a catalogue of 1000's of images over many years, classic and up to date so we can accommodate what it is you are trying to acheive for your cabinet. We have very rare machine images which we have spent time reproducing and re-drawing to match the original classics as well as our own designs we have created for various customers. 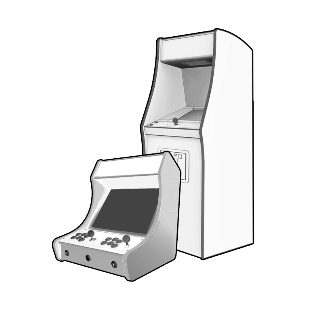 We work with many arcade machine builders such as https://www.facebook.com/vividarcades/, http://www.customarcademachines.co.uk and https://retroisnow.co.uk who require a high standard of materials, print and design quality. We use the best technology in Roland printers as well as Roland inks and LG Premium vinyl materials. We laminate all our products to maintain a long life and give hard wearing of the graphic for upto 10 years. We are constantly updating our range of graphics week by week and this website holds only a small percentage of what we have, we regularly update the website adding new designs so keep checking back with us and look for a 'Newly Listed' icon on the product for sale. Alternatively email us with what you need, chances are we have it. Just provide us with the requested sizes and the design idea you have and we are sure we can accommodate you. You can also send us your cab drawings or rough sketches and we will make images fit perfectly, you will be impressed with the turn around time and cost. We have great customer service and are sure you will be very happy working with us. Any questions or need any advice call or email us.